Colorful Seasons Garden Center carries a large selection of fruit trees, both Standard and semi-dwf varieties. Some varieties of fruits need two for cross pollination, while others are self pollinating. Small fruits grow 1 to 3 feet tall and produce fruit within 1 to 2 years. Fruit trees bear fruit. 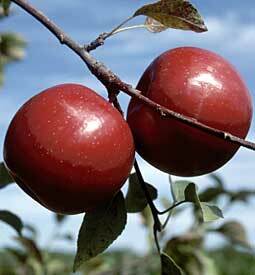 Some examples of fruit trees are apple trees, peach trees, pear trees, cherry trees, and many more fruit trees. 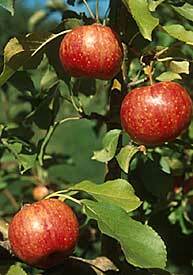 Apple trees are very common and include many different varieties in their category alone. Many more varieties become available throughout the season. Please call or stop in to check out our complete selection. and late bloomers with late or midseason. Frostbite. A unique small & very sweet, intense taste. Crisp, but firm texture and juicy.Extremely cold hardy. size red juicy, keeps well, hardy and sweet. U of M intro. and juicy. Stores up to 5 months. Good flavor ! U of M intro. fruit, similar to golden delicious but stores better. U of M intro. MCINTOSH – Mid-season bloom. 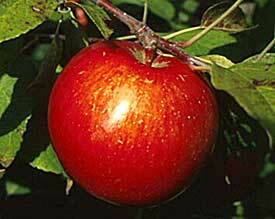 A well known older apple that has a sprightly flavor and med. storage life. Nearly solid bright red skin. Heavy bearer. Good for eating and baking. Fruit tends to drop when ripe. ZESTAR! – Early season bloom, crisp & juicy known for its sweet tart flavor. Longer storage life. Excellent for fresh eating and cooking. U of M intro. Ripens: Late August. TRIPLE PLAY APPLE – Semi-Dwf. MT ROYAL. – Early May bloom. 8-12’ ht., blue fruit, good eating off tree. Dessert, jam and preserves. Freestone. One of the best blue plums in MN & Wisconsin. Self fruitful.